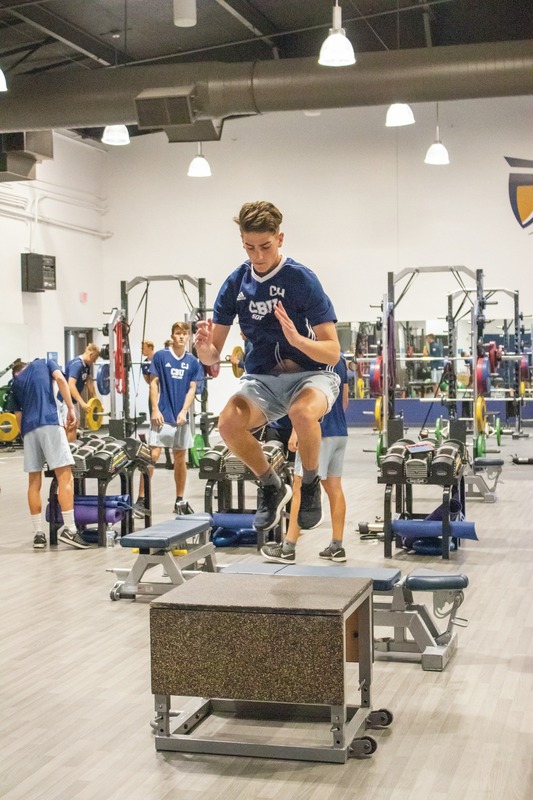 California Baptist University’s men’s soccer team kicks into gear a little early this year as they compete in spring games to prepare for the regular season next fall. The Lancers finished the fall season with nine wins, nine losses and one tie. They hope to use the experience and game time they gain this spring season to better their overall statistics and performance in the future. CBU has 19 returning players who have been training since they wrapped up their regular season games under the leadership of Coe Michaelson, head coach of soccer. Michaelson has been CBU men’s soccer head coach since January 2016 and plans to use his experience and knowledge to drive the team forward. Looking back on the fall season, Michaelson evaluated the topics that need to be developed within the group — the training load, the fatigue the players are carrying, and when the next game is — to determine the type of training. Along with a combination of strength training and normal practices, Linus Mansson, junior business administration major and defender, said there are other ways the Lancers are growing as a team. Not only do the spring scrimmages give the team time to work on learning new skills, but it also gives the team time to grow in community with one another. Victor Aguirre, junior business administration major and midfielder, explained how team chemistry is a pivotal part of team success, making the spring an essential part in building this aspect. Through training and team bonding, this spring season promises hope for continual progress as the team takes on some high-ranking opponents. Their games include California State University, Northridge, the University of California, Los Angeles, and the University of California, Irvine, who each held a spot in the NCAA Division I top-25 rankings last fall. The Lancers will also face Azusa Pacific University and California State University, San Bernardino, who fared well in Division II competition and postseason.